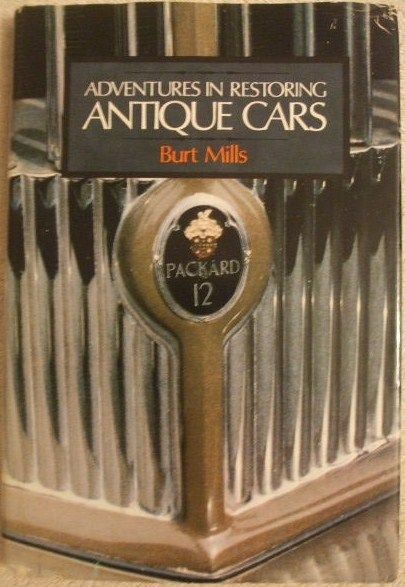 First US edition, first print hardback of ADVENTURES IN RESTORING ANTIQUE CARS by Burt Mills, published by Dodd, Mead & Co., New York, in 1978. With full numberline 1 2 3 4 5 6 7 8 9 10 on the copyright page. The book is in very good condition (Clean bright red cloth boards with black lettering on the spine which has minor bumping to bottom edge of spine and to one of the top corners but nothing too drastic) with slight wear to the dust jacket which is price clipped (minor creasing with some rubbing and chipping to the spine edges and corners, a one inch closed tear to the top corner at the back and slight tanning to the inside jacket). Internally, the pages are clean and tight and there are no tears and no inscriptions. "For over twenty-five years Burt Mills has been restoring old cars. During that time he has worked on a surprising variety, among them the 1935 Packard V-12, 1951 Kaiser, 1923 Franklin, 1926 Marmon, 1948 Hillman, 1941 Lincoln Continental Coupe, the Mark V Jaguar and a Phantom III Rolls Royce. Here he provides an account of his experiences that is as delightful as it is informative. Though antique cars are not as plentiful as they once were, they can still be found almost everywhere. Parts, too, can usually be found, although occasionally they have to be specially made. The search may take the restorer to farm auctions, flea-market sales, and into old warehouses and chicken coops. Most restorers pursue their goals with the zeal of Crusaders. Some old cars, as Mr. Mills notes, may be beyond prudent restoration, simply not worth the cost. Yet even some of these can be given a new lease on life: a stodgy old sedan can be converted into a touring car or speedster, a humdrum coupe into a roadster or convertible. Here, profusely illustrated, is an essential book for anyone interested in restoring antique cars." 265 pages. Illustrated with black & white photographs.